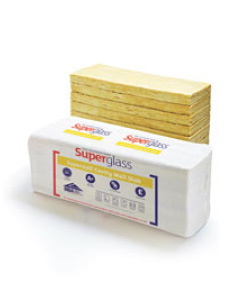 Superglass Superwall 34 is a British Board of Agrément (BBA) approved, non-combustible and water repellent glass mineral wool insulation cavity wall batt. The flexible batt is supplied at 455mm wide to allow easy installation between standard vertical wall tie spacings and minimum on-site cutting and waste. Superglass Superwall 34 is designed to provide thermal insulation in full-fill or partial-fill external masonry cavity walls, up to 25m in height for full-fill and with no height restriction in partial-fill (additional requirements apply for buildings above 12 metres in height for full fill and above 25 metres in height for partial fill). Superwall 34 is BBA approved for use in all UK exposure zones (subject to conditions detailed in the BBA Certificate and NHBC Standards). – Provides excellent thermal performance with a thermal conductivity of 0.034W/mK. – Approved for use in all UK exposure zones. – Classified as A1 non-combustible (the highest possible rating). – Manufactured from up to 84% recycled glass. – BRE Green Guide Rating of A+ and ISO 14001 accredited. – Simple installation between standard wall tie spacings. All Superglass products are deemed non-combustible and have a fire classification of A1 – the highest possible rating when tested to BS EN 13501-1 Reaction to Fire. Manufactured in accordance with ISO 14001:2015 – Environmental Management Systems. Zero Ozone Depletion Potential & zero Global Warming Potential. Generic BRE Green Guide Rating of A+. Manufactured from up to 84% recycled glass which would otherwise go to landfill. Tests by the BBA confirm that Superwall 34 will not transmit water to the inner leaf. Please refer to the BBA Certificate for more information. BS EN 13162:2012(+A1:2015) Thermal insulation products for buildings – Factory made mineral wool (MW) products. BS EN 13172:2012 Thermal insulation products – Evaluation of conformity. ISO 9001:2008 – Quality Management Systems (QMS). Supplied compression packed in polythene to provide short term protection. For long term protection, the product must be stored indoors or under a waterproof covering in order to protect against weather damage. Should not be left permanently exposed to the elements.